We are always please to hear from any of our members who would like to assist the running of Society events , support our fundraising activities, or assist with the post excavation processing and cataloguing of finds. 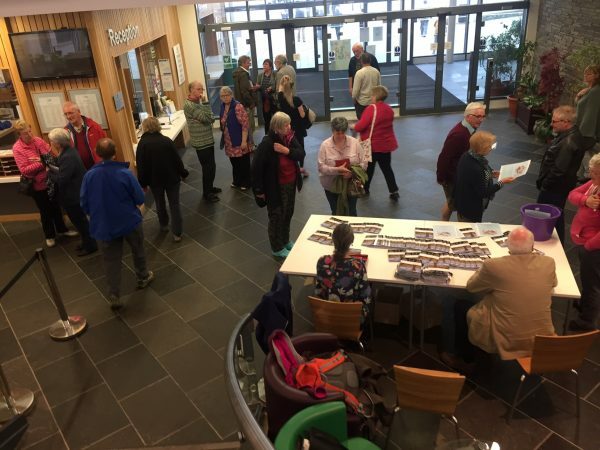 Recently volunteers have given their time to assist us manning the Blue Door Charity shop in Kirkwall, and to help staff the OAS shop at the Ness of Brodgar excavation. We are also always looking for volunteers to assist the Orkney College Archaeology department in processing and cataloguing the mountain of finds that are unearthed each season from the various Orkney excavations such as the Ness of Brodgar, and The Cairns on South Ronaldsay. If you would like to support the Society in this way please contact us with your details. Please note that there are limited numbers of places available for volunteers on some of the well-known excavations in Orkney, such as the Ness of Brodgar, which receives many hundreds of requests each year, so unfortunately it is not always possible for site directors to give places to everyone who wants to dig. The OAS is sometimes approached by the project directors of Orkney excavations seeking volunteers to take part as diggers. The requirements of each excavation will vary, some projects will be looking for experienced volunteers, others will happily take ‘first timers;, giving all required on-site training. If we receive a request for assistance from an excavation we put potential volunteers in contact with the excavation’s dig director. Normally Site Volunteers should be aged 18 years or over, there is no upper age limit, but you should be happy to work in the open air regardless of what Orkney’s weather may throw at you, and possess a full set of waterproofs and stout boots!